Image Comics, one of the largest independent comics publishers, shocked everyone today with the news that they were now selling digital comics from their own website - DRM-free. Comic book publisher Image Comics announced at its Image Expo convention that it will now sell all of its digital comics as downloadable via its website for both desktop and mobile users, making it the first major U.S. publisher to offer DRM-free digital versions of comics. Readers can even choose the file format they prefer: PDFs, EPUBs, CBRs or CBZs. Don't worry, Image won't be giving up their current distribution channels; they're just adding a new one that enables the publisher to deal directly with customers. You can still find Image Comics titles, including popular series like The Walking Dead and Saga, in iBooks, comiXology, the Kindle Store, and elsewhere. So why add a new venue? First, the artist/owners of Image Comics have come to the conclusion that piracy isn't actually the terrible killer that some in publishing have made it out to be. “My stance on piracy is that piracy is bad for bad entertainment,” Image Comics publisher Eric Stephenson told Wired. The current distribution channels for digital comics aren't all DRM free, so Image decided to sell direct. Also, digital comics are now 12% of revenues at Image and they're expecting that to increase to 15% in 2013, and possibly go even higher. Given that digital comics don't necessarily need the distributors required for getting paper comics into stores, Image wanted to try to cut out the middleman. Wired broke the news earlier today, but I think they got a little too excited. Wired is talking about this like it's the first time any comics publisher has ever considered going DRM-free. That's not even close to being true. Sure, Image Comics is the most significant comics publisher to forgo DRM, but there have been a number of other digital comics retailers that did it first. DriveThroughRPG, for example, sells digital comics as watermarked PDFs. And they're not the only one. But even if Image Comics is not the first, they still get points for offering multiple formats and not just basic PDF. The help page on the Image Comics website says that you can download PDF, CBR, CBZ, and Epub. I have to give Image Comics credit for offering formats, but the important question on my mind is what type of Epub are they offering? Given the wide variety of proprietary fixed layout formats as well as Epub3, that's not a simple question. Unfortunately there currently is no way for me to find out. 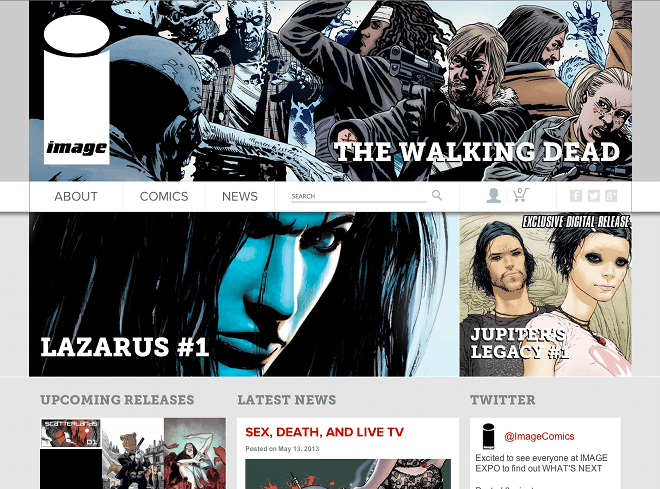 The Image Comics website is only semi-functional at the moment. I have tried to register for an account so I could buy a comic and take it apart, but the activation code keeps failing. The help page was no help either; the info on that page is contradictory and needs to be corrected. For example, it says that you can read the Epub with Aldiko, the Kindle app for PC or Android, or iBooks. So naturally I am taking all technical info with a grain of salt. If anyone has succeeded in buying one of them there digital comics please leave a comment and share what technical details you have. Update: Rob Sniders has left a comment saying that the Epub uses Apple's fixed layout format. Thanks, Rob! I was able to purchase and download SCATTERLANDS #1 just now. It fails Epubcheck 3 because of a lone ampersand in the book description in the metadata… it’s looking for a character entity. The book is Epub 2 using Apple’s fixed layout spec. Text is flattened on the images, rather than text overlaid on the images using CSS. In any case, the book is 54 rectangle panels oriented for landscape view. If it were a print comic, the panels are a little larger than 1/3 of a page. I also purchased INVINCIBLE UNIVERSE #4, but it’s not available until sometime on 7/3 (which it is here in the Eastern time zone). I fixed the ampersand issue in my copy and repacked the file. It passes, although Image doesn’t properly assign a UUID or ISBN so Epubcheck gives a warning. Sadly, the FL isn’t done properly and the landscape images stretch to fit portrait orientation. Looking at the XHTML for the pages, they’ve transposed the width and height, both in the meta tag for viewport as well as the image tag in the body of the XHTML file. The mistake is repeated in the CSS (which has far more selectors than they actually used in the book itself). Apparently no one at Image QA’d this. At all. INVINCIBLE UNIVERSE #4 is also built using Apple’s FL spec. It’s more like a traditional comic and it worked on download. I emailed Eric Stephenson, Image’s publisher, about the problems with SCATTERLANDS #1. No reply and I’m not surprised given the holiday week.